NeverSeconds: Jubilee day off and a Challenge! Jubilee day off and a Challenge! 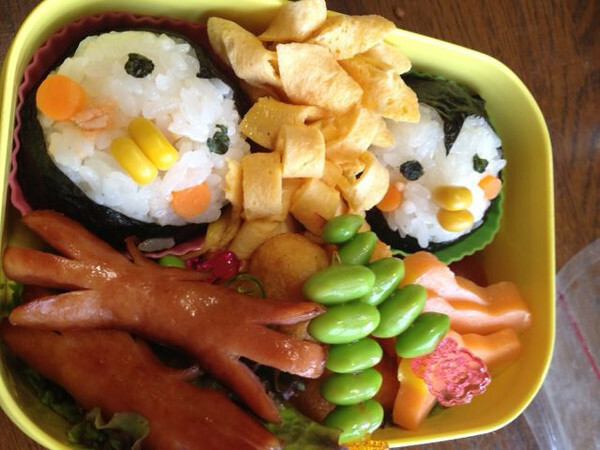 Mai made this for her niece and I think the penguin rice balls are so cute! I am not sure what else is in her box but it is all so beautifully prepared. So here's the challenge. Dad and I are going to try and make our own penguin rice balls for lunch tomorrow. I'll post up our photos so you can see whose is best! If you fancy giving it a go as well send your photos to neverseconds@gmail.com . The book yum- yum bento box by Crystal Watanabe and Maki Ogawa is in English and shows some great easy bentos to make. I use it to make my little one special bentos evert once and awhile. Those are sausages cut to look like octopuss and an omelet for the yellow ribbons. The green beans are edamame, (soy beans) really yummy. And probably carrots cooked and cut with a veggie cutter, like a cookie cutter. Veg: While you're on holiday, show us what you get for lunches at home - it should be a great contrast to what's at school. What a delightful blog, Veg! You got a write-up in the thisistrue.com newsletter, and I visited here from there. Keep up the great work, you're a natural writer! Oooh! The penguins look so cute!! Fabulous blog Veg, I enjoy seeing what you have for lunch at school, especially since I grew up here in the U.S. It's always interesting to see what other children eat around the world. Keep sharing and do show us what you do at home for lunches. Just found your blog today. It's excellent! It reminds me of being in the 5th grade and insisting my school lunches were rubbish to my dad. He took the day off work to come eat lunch at school with me (embarrassing). After, he would not concede they were rubbish, but said they left something to be desired. I see a definite improvement in your school lunches since you started blogging just a short while ago. Other commenters are correct, though. You need to have a more balanced meal with more protein. If you can't eat more meat, maybe some dairy milk or cheese to help increase the protein. My daughter eats a lot of beans and rice together to form a complete protein. It's a lot healthier than too much of anything, carbohydrates included. Potatoes + pasta = too much carbs! Maybe you'll be a nutritionist when you grow up! Or a celebrity chef! Your blog is amazing! Keep it up, Veg!!!!! I'm a new reader to your blog and love it! It was on a popular Finnish newspaper today (http://www.iltalehti.fi/ruoka/2012053015647935_ru.shtml). Veg, I just wanted to add that you can buy edamame (fresh soya beans) in the UK now from the freezer section of supermarkets. Some people have also started to grow their own in the UK so your dad might be interested in trying that, but I don't know if they will grow well in Scotland. They're quite tasty and nutritious, well worth a try. Those are hot dogs that have been cut before cooked. Sometimes to look like an octopus or other animal. The green balls I believe are edamame. I think underneath is melon cut in the shape of a teddy bear's head with a cookie cutter. This is called Bento. They are very fun. If you want to know how the nori are cut easily there are little stamp cutters with different shapes. You can find online different tools to make bento. There are presses for shapes for the rice and stamp cutters for the nori. Also little bottles for soy sauce and cute little boxes to carry your lunch. Have your Dad check amazon for bento tools and supplies. I think your school lunches are great and I love seeing what other children from around the world are eating. I am a teacher librarian and I bring my lunch to school every day. Perhaps I should take a little more time and make it a little more fun. Hello, Martha! I've just returned from living in Japan for a year and a half, so I'd like to tell you what's (probably) in that bento! As a few people have said, the green beans are edamame, a kind of soy bean. The cut items on the bottom left are hot dogs, which are very popular in Japan! Lastly, the yellow bit in between the penguin onigiri (how you say rice ball in Japanese) is scrambled egg, usually prepared with soy sauce and a little sugar.